CMC Markets review - Scam? Mobile? Demo account? Read more. CMC Markets is an incredibly popular derivatives broker based in the United Kingdom. The broker offers over 10,000 tradable assets in the shape of forex trading, CFDs, and spread betting. This broker really has it all. Besides offering one of the largest selection of underlying assets that we’ve ever come across, the forex broker also has an around the clock support team, tight spread, minimal fees, cutting edge charting tools, and excellent opportunities for market analysis. Although, the most impressive aspect of this broker is that the company behind it has decades worth of experience from the financial industry. 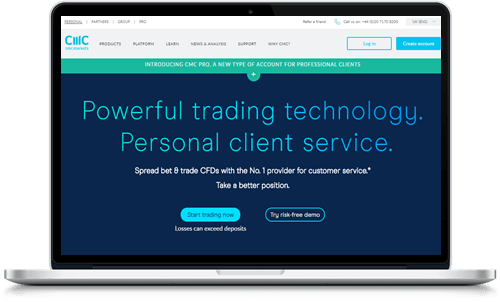 CMC Markets is not only one of the best CFD, forex, and spread betting brokers in the world, but they also have one of the best platforms in the industry. As if that wasn't enough, the also have 30 years of experience from the trading industry and a selection of assets that only a select few brokers can compete with. All in all, this UK-based broker belongs to the top tier of derivatives brokers and we can recommend them enough. Is CMC Markets a Scam? Absolutely not. CMC Markets is fully regulated, has a great reputation in the industry, and hundreds of thousands of satisfied customers from all over the world. We have used CMC ourselves and have put the broker through our rigorous evaluation process and are confident that this broker is as legitimate as they come. In fact, CMC is one of the most serious brokers out there today. And they have a very good reputation as well. If you ask around on forums, you will see that CMC Markets has a good reputation, even with the traders. Forums are usually quite harsh on brokers, people that have lost money are usually emotionally upset and that affects their user reviews. You can rest assured that CMC markets are not a scam. Trading with CMC Markets is always a breeze thanks to their intuitive platform. The CMC Markets trading platform comes in two versions, one standard and one advanced version that is best suited for professionals. Every step from the analytic pre-work to the actual execution is easy to perform, and the tools that the platform comes with are some of the best we’ve ever seen. In 2017, CMC Markets’ charting tools ranked highest in the world according to a survey done by Investment Trends, and we agree that it’s one of the best platforms out there. With 115 technical indicators, 70 chart patterns, and 12 different chart types, CMC Markets’ platform can easily be used even for the most technical strategies and experienced traders. In fact, in certain ways, CMC Markets is almost better suited for professional day traders than beginners that run the risk of being overwhelmed by the sheer number of extremely useful tools. It is 2018 and it shouldn’t come as a surprise that the tools on CMC Markets are available on all the most popular mobile devices. You can download the CMC Markets trading app from the respective app store and enjoy one of the best mobile trading experiences in the industry. There are two account types you can open with CMC Markets. You can either open a trading account that you use to trade CFDs, forex and spread betting or a CMC Markets demo account. Opening a demo account is easy, and it only requires your name and email and that you verify the registration by clicking a link that CMC Markets sends to you. Opening a real account will require you to go through the entire registration process, which will require information about who you are, proof of said information and a few questions to answer. CMCMarkets are very fast with approving any pending applications so you will be able to have your account up and running in no time. Are you impressed yet? Well, you definitely will be in a few seconds. In addition to all the amazing features we’ve already mentioned, CMC Markets offers something truly unique. They have a selection of over 10,000 tradable assets that are available to all customers. To put things into perspective, that’s roughly 8,000 more assets than the average broker offers, and this is how it’s organized. 300 currency pairs ranging from the largest currencies to the smallest ones. 90 equity indices are available, meaning you can trade all of the most influential indices in the world. 100 commodities including Brent oil, gold, silver, natural gas, and many more. 9,400 stocks from companies registered in 23 countries around the world. This is by far the largest selection of stocks as CFDs that we know of. There is also an asset class dedicated to treasuries such as bonds, gilts, and treasury notes. In addition, CMC Markets also offer spread betting on most of their underlying assets. Where Is CMC Markets Regulated? CMC Markets is licensed and regulated by the British Financial Conduct Authority (FCA), an organization that belongs to the top three regulatory bodies in the business. Having an FCA license qualifies CMC Markets for most of the European market, with the exception of Belgium. Some brokers apply for more than one license in order to reach more customers, but CMC Markets has decided to only work with FCA which is more than enough in our eyes. Being regulated by FCA means CMC Markets is subject to regular audits, they have to operate following strict guidelines, and client funds up to $50,000 per person are protected against non-traded losses. There are only two ways in which one can fund a CMC Markets trading account. You can either send money from your debit or credit card or you can make a traditional bank wire transfer. Note that American Express and Diners lack support and that extra fees can be applied for international transactions. Withdrawals can be done to a bank account that is registered in your name just make sure to add the account information as soon as you can since the approval process can last a few days. We have mixed feelings about CMC Markets’ support. On one hand, it’s cutting-edge, the staff is very knowledgeable, and you rarely have to wait more than a few seconds to be connected to someone over the phone. The broker also has an FAQ that could best be described as an encyclopedia of trading information. On the other hand, there is no live chat function, and written emails aren’t answered as fast as we would like them to be. With that being said, CMC Markets’ support is really good, and we have gotten efficient help from them every time we’ve needed it. To contact CMC Markets, you can either call +44 0207 170 8200 or you can visit the support page on the broker’s website and click the “Email” button to email them directly. If you’re one of those people that quickly get bored from not having enough options, then CMC Markets is for you. This broker does not only provide one of the best CFD and forex trading experiences in Europe, but they also offer over 10,000 tradable assets spread over multiple asset classes. CMC Markets is also fully regulated, and the company behind the broker has over 30 years of experience from the industry and that experience shines through in every aspect of the broker.